In a forest edge at Kakamega Reserve, Kenya, Africa. Dec. 2014. SUB-SHRUB: Leafy herb or slightly woody to 1½ meters tall. 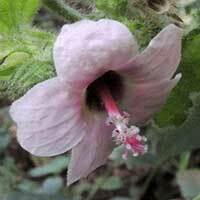 FLOWERS: The flowers are pink to mauve with five relatively large petals. Stamen filaments fused into fleshy column. 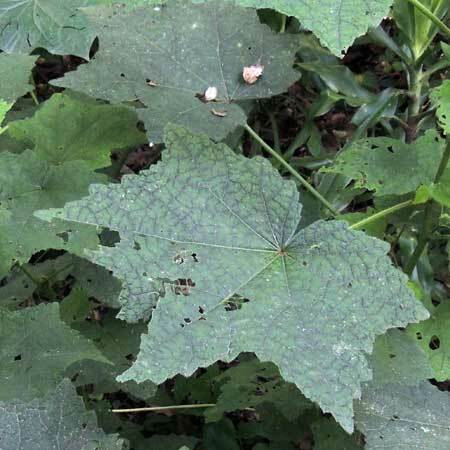 LEAVES: The leaves in this example are very broad, but narrower leaves are possible; three or five wide lobes. RANGE: Native to tropical Africa, but also found in tropical America and elsewhere. FRUIT:Sphaerical and only about 3cm in diameter. Surface with bur-like projections.